Hello and happy Tuesday friends. Just touching base to say it's a crazy busy project week. I'm stretched thin so I'm going to leave you with this office pretty for the next few days. I IG'd it (here) because they look so great together. I love it when one versatile piece, in this case the Designer's Guild Orangerie cushion, can migrate and hold it's own in different spots in the house. A sign of a good purchase to me. Wishing you a major productive week! Orangerie is a favourite. It works anywhere because it has any and every colour in it! A real winner. Hugs. Ooooh I just l love your office ...... it's the prettiest one out there. You take care of yourself!!!! 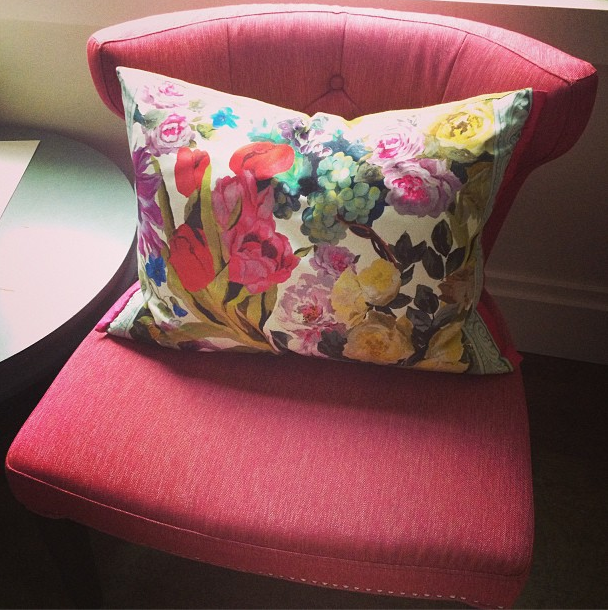 LOVE a great pink chair! Have a great weekend Erica!